If he has a conscience he will suffer for his mistake. That will be punishment – as well as the prison. Buttermilk biscuits hot out of the oven! As you entered the office, the hall was long and narrow with a counter on your right and a wall on your left that ran from the school’s front door to a secondary entrance into the main hallway. It was an anti-chamber that ensured some prescreening of individuals who wanted to come into the school. These screams, however, were not from someone trying to get in to the school, but Andrew trying desperately to stay out. Long before the sounds of agony would reach my back office, Andrew would have been locked into a battle of oppositional defiance with his uncle that started hours before in their apartment and continued through the streets on the way to school. By the time they would get him to the front of the school, Andrew was so agitated that he would burst through the doors with the snarling cries of a wild animal backed into a corner with nothing left to do but fight or die. He knew that someone still had to get him down the narrow passage before the fight would be over and his last move had to count. Lunging at his uncle and grabbing at the walls, he would start to rise in the air. Seeming to levitate like a scene out of the Exorcist, Andrew would hover three feet off the ground in an act of defiance that betrayed the laws of nature. He pulled off this sleight of hand by wedging his slender frame between the front counter and the wall. Grasping blindly to secure a stronghold on the countertop, he pushed his left foot against the opposing wall. This modified Iron Cross was a feat of strength that belied his childish appearance and lifted him horizontally in the air, with his other leg free to kick anyone who tried to bring him into the school. As Andrew’s daily entrance reached the apex of hysteria, the office staff would have come to the rescue and the school psychologist would have been called. Together we would grab hold of Andrew and ask his uncle to leave. Within minutes, Andrew would be calmed down enough to at least go and sit with the psychologist in her office. Sometime later, she would walk him to his class where he would slip into a child-sized chair behind a child-sized desk and try to find some normalcy in a life filled with adult-sized issues. Everything had been taken from him, and his aging uncle didn’t have the resources or capacity to give back any of the basics that a child in his position needed to survive. Andrew’s life was devoid of any structures to provide him with a sense of security and safety, and he reacted like a trapped dog in an animal shelter who had lost all trust in humanity. He desperately wanted to be loved, but had decided that growling and barking was a safer alternative for basic survival. The decision to become Andrew’s guardian had just been made and a quick court date was only three weeks in the future, but by California law he had to be living in my house before they would transfer custody. Suddenly it hit me that in just one week Andrew would be moving in and I would be come a dad. With Andrew’s morning ritual ringing in my ears, I knew that I needed to figure out a way to get Andrew to school. His uncles had tried scaring him with religion, beating him with hands and sticks, and even having him hold books over his head for hours while he kneeled on the bare hardwood floors. These brutal acts of parental desperation only increased Andrew’s defiance. This was going to be my first act as a parent, and I decided to try some basic teaching 101 and create an incentive to get him to school on time. I explained to Andrew that he would be coming home with me in exactly one week and that we would stop by Borders Books on our way to my house. I laid out a plan that would allow Andrew to buy some books of his own. His eyes lit up, and I explained that if he came to school on time and without putting up a fight on Monday he would earn one book. If he arrived Tuesday on time, he would earn another and so on until Friday, with a grand total of a possible five new books. He said he’d take the challenge, and I left for the weekend. The truth be told, I forgot I had made the arrangement with Andrew and when I got to work Monday morning the secretary told me I had a visitor waiting in my office. When I got there, I found Andrew sitting with his uncle. I had arrived at 7:30 a.m. and school didn’t start until 8 a.m., but they had been there since 7:15. The uncle explained that Andrew woke him up and forced him out of bed. Today’s fight had been to get the uncle going, not Andrew. Andrew continued to arrive everyday before 7:30 a.m. and had even walked himself to school one day when he couldn’t get the uncle out of bed. Even as unsafe as a lone walk in the “hood” could be, this was a clear win. I was proud of Andrew and his accomplishment, but I was also naively feeling a sense of pride that bordered on smugness for the part I played. After years of analyzing other parents’ inability to get their kids to behave, I just turned a daily problem for Andrew and the school around in less than a week. Andrew would soon wipe the smug smile off my face. Friday arrived and Andrew was excited to get going and visit the bookstore. I was suddenly nervous. There was no turning back on my decision. When we walked out that door, I would be a dad. It started to rain as Andrew buckled himself into the backseat of my car. Real winter weather is a rarity in Los Angeles and it was a welcome backdrop for my fantasy of playing dad. I still had visions of a grateful kid eager to lean on my every word as we sat by the fire and I read stories to him. We pulled out onto Santa Monica Blvd and Andrew reached forward and grabbed my phone. Within seconds he was moving in and out of programs looking for games and manhandling it as if it were a tinker toy. “Andrew, you can’t just grab my telephone like that. Please give it to me,” I said, as I reached back with an open palm. “No. I just want to see if you have…” he rambled on barely intelligible and oblivious to my petitions. “You are getting four books,” I stated with as little emotion as possible. This was crazy. Somehow he was able to understand that his own behavior was predictable and believe that I could be devious enough to mastermind a plan to save money. He was also able to pinpoint my own anxiety about money and the costs of raising a kid. I was feeling anxious, but somehow remained calm. I explained as clearly as I could what had happened and how his own actions were at the root of his loss. Andrew’s entire demeanor suddenly turned from angry to sweet as can be. “I promise. I will never, ever do this again. I promise. Really, I promise,” he cooed as kind and apologetic as I’d ever heard him. His Oscar-worthy performance brought every trauma he had ever been through to mind and it began to haunt me — poverty, mother who had died, uncles who beat him — I could see and hear the sincerity in every plea for leniency. Perhaps I should trust him. Suddenly, Dr. Laura was in my head. I don’t really like Dr. Laura, but enough long drives to Utah with only her to accompany me on the A.M. radio had left an impression. This giving in to children’s pleas even after the law had been laid down was a bad idea. I knew what I had to do. And then the kid I knew from the satanical rituals he had performed with his uncle every morning for the last few months was sitting in the back of my car. I swear his head did a 360 on his neck and he started spewing out angry and hateful words that were mean and utterly disrespectful. Andrew didn’t say a word and he didn’t speak for a long time. So long that we had slowly wound our way through the traffic to get near the book store. “Andrew, we are almost there. Are you ready to speak to me with kindness and respect?” I asked testing the waters. I decided that was a good place for him to be, and we continued to drive in silence until I knew I had to turn into the store or go home. I told him it was decision time and asked him if he was ready to treat me with respect. I can still remember that first day with Andrew in the bookstore. He ran from shelf to shelf and pulled out at least a hundred books. He was like… well, like a kid in a candy store. Only better. Much better. He eventually chose his books and he never asked for a fifth. I didn’t offer it. We left and he sat in the back of the car like a Czar among his treasures. All anger gone, he beamed with happiness. I had set my first boundaries and he had done what kids do everywhere; he tested them. Andrew must have felt the first inklings of safety that comes from finding out the walls a parent sets for you are secure. He was right. I didn’t deserve it. But I have come to understand that it’s my job to accept the childish abuse for what it is and through the alchemy of parental love and patience transform it into a safe and secure stepping stone across the wide river we call growing up. Now when I see the young man he is becoming, and even though I may not deserve it, I can’t be more grateful for being the lucky one he feels safe enough to call Dad. 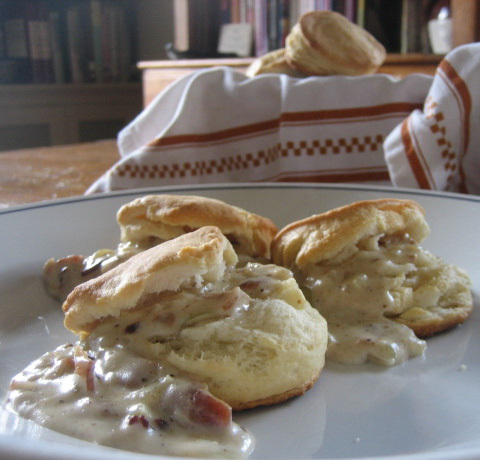 My own memories of biscuits and gravy are deeply tied to my childhood. My grandmother was a farmhand cook for many years, first in Iowa on the family farm an then in Nevada as a hired cook. She would tell stories of a daily breakfast with astonishing amounts of food to be served. They would get up before 3 a.m. to light the wood-burning ovens and have biscuits, bacon, eggs, ham, potatoes, pancakes, and coffee all ready before the men started working at 5 a.m. Grandma would serve her biscuits with what she called chicken gravy. This is a white-roux-based gravy cooked in bacon fat or the fat left over from the addition of sausage, but was traditionally made from the left-over fat of a roasted chicken. This was Andrew’s first breakfast at the house and has remained his first choice for Sunday morning to this day. I suppose if we lived on a farm and got up and worked the land I would serve this much more than I do, but since the only land Andrew has ever worked are battle fields in cyberspace, it remains a special treat for rainy winter weekends. Biscuit dough makes a great topping to transform a stew into a spectacular homey meal. 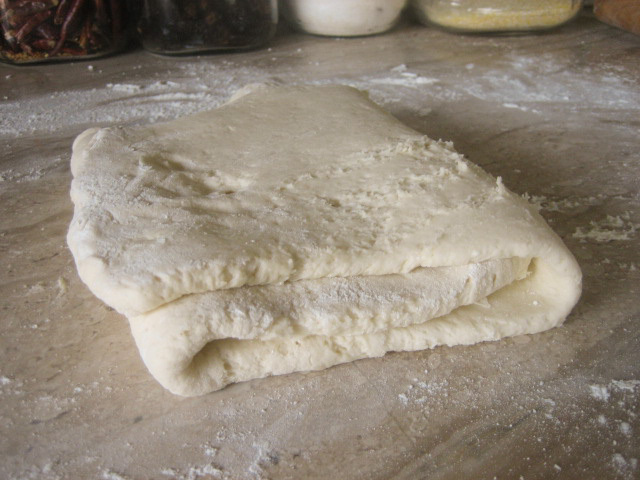 Just roll out the dough and 20 to 25 minutes before you are ready to serve the stew, fit the dough on top of the stew to cover completely. Whenever I make a batch of Bea’s Thick Chicken and Rice Soup (See My Son The Zombie Killer, March 2007), I add some fresh sage and thyme to the dough and turn day two’s left over’s into an instant chicken potpie. Stir or sift together flour, baking powder, salt and any herbs, if using. Using a pastry scraper, or even two knives, cut in the fat until the flour starts to feel a bit crumbly. 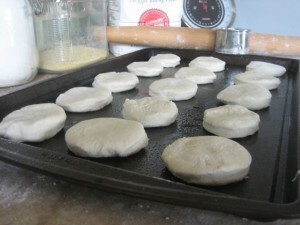 Don’t over incorporate the fat as some little pieces left in tact will create a fluffier biscuit. 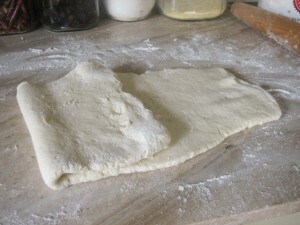 Roll out the dough on a floured work surface using a nicely floured rolling pin into a rectangle about a ½ to ¾ inch thick. Fold in thirds and roll again. Repeat once more. Step 2: Fold other third and roll into rectangle again. Using a biscuit cutter or the mouth of a water glass, cut out as many biscuits as you can and then reroll the dough cut more. Continue until dough is gone. This should yield about 16 biscuits. 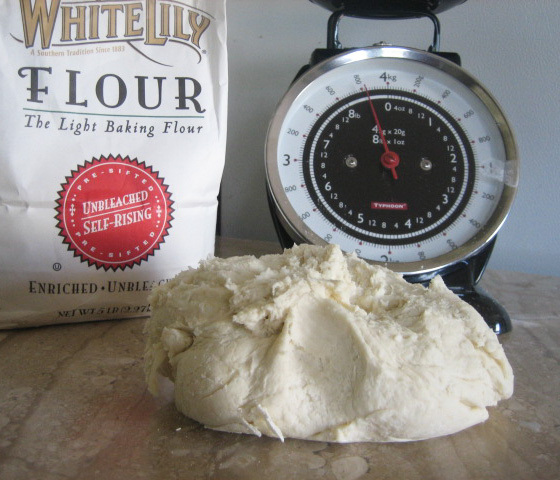 Note on flour: I like to use a Southern self-rising brand called WhiteLily when I can find it. I don’t really know if the Southern connection makes a difference, but self-rising flour makes biscuits a breeze. If using, eliminate the baking powder and salt. 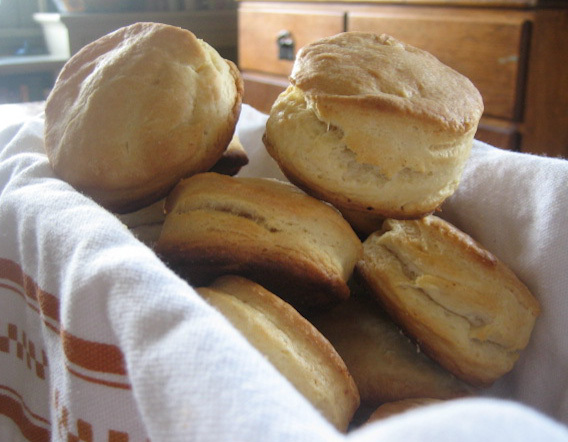 Note on fat: I use lard and this, hands down, makes the best biscuits. Crisco shortening is my second choice. However, you can use any solid fat you have on hand. Duck fat makes a great savory biscuit with the addition of some fresh herbs like rosemary, thyme, or sage. There was a time when Andrew wanted sausage gravy, but now opts for bacon. Both are great and require an extra half hour at the gym! Fry up the bacon or sausage in a large fry pan with high sides. When cooked remove the meat and when cool enough to handle, crumble and set aside. Pour out all but 3 or 4 tablespoons of fat, add onion and sauté over medium heat until translucent and starting to caramelize. Make a wet roux by mixing ¼ cup milk with ¼ cup flour and mix until smooth. Add roux to the onions and using a whisk, stir until smooth. Let roux cook with onions for a couple of minutes. Slowly add milk to the mixture and cook until thick. If too thick, add more milk until you get the consistency you desire. This is not a science, but done by taste and feel. Add crumbled meat and finish with salt and pepper to taste (we use a lot of pepper). Next post: Happy Birthday. Now shoot me!